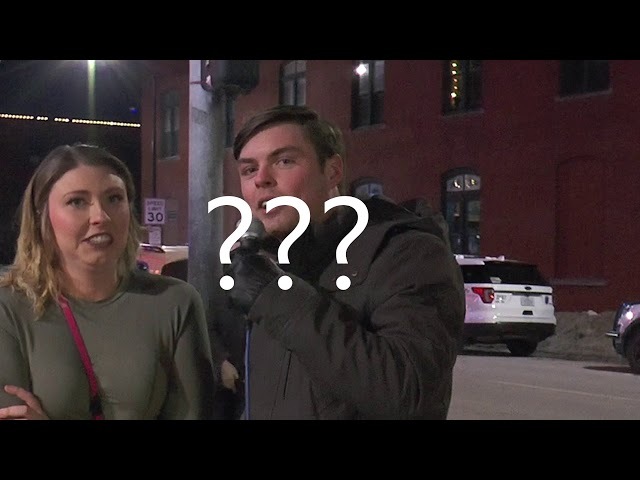 Am I High or is this a Street Puppet Show? On the corner of Clark and Berwyn in Andersonville, a Chicagoland neighborhood, old-timey music from the ‘60s drifts in the wind. Little kids and groups of friends gather close to the sound, tapping their feet to match the song’s rhythm. They pull out crisp dollar bills, flattened in their hands. The sun is setting, but the overhead street lamp illuminates the puppets holding the audience’s attention — a tattered cat and a big fluffy dog — dancing side by side. There are no chairs for the people watching and no stage for the puppets who are performing. The puppets pop up in front of a black curtain. First the cat, then a monkey, a rat, and a penguin. The painted, wooden structure in which they perform gives off a magical allure: Reds, greens, and mystic blues and black swirl together in an eye-catching way. Not to mention, this structure is attached to a bike. At this very moment, the bike is parked, so the structure sits firmly on the ground. After the performance ends and the audience slowly disperses — back to the everyday drawls of reality — the Puppet Bike packs up and disappears into the night. The Puppet Bike brings a child-like atmosphere to a fast-moving city. It slows things down, both for those watching and those performing. It’s pure, serendipitous street theatre, showing up to spread happiness and goodwill when it’s needed. 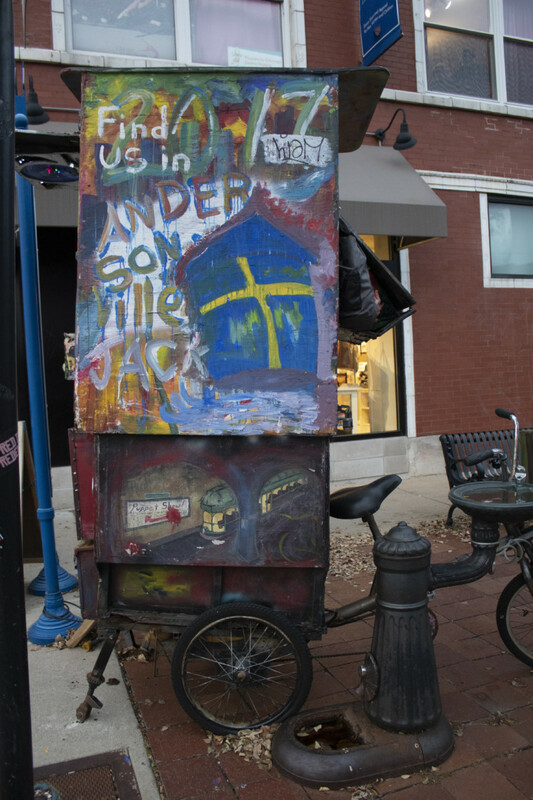 Citizens of Andersonville know the Puppet Bike well — it’s been the show’s home base for quite a few years, as it’s the hometown of the original creator. The bike was created in 2004 by Jason Trusty for a friend who couldn’t keep up with the rigors of corporate America. He was first inspired to make a roaming coffee house, but when he saw a puppet show in Colorado, his idea shifted, and he hasn’t looked back. 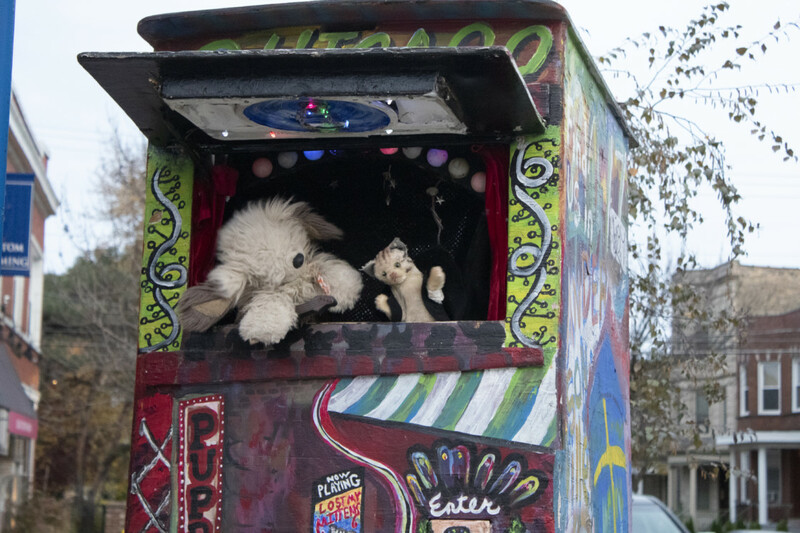 Over the years, Trusty has stepped back from performing, handing off the reins to his two main puppeteers, Chock, who goes by a stage name, and Carla Freudman, who both started as fans of the Puppet Bike. Occasionally, if entranced audience members ask to give puppeteering a try, they can climb in and give it a whirl. Chock was once one of those enamored onlookers who ended up climbing into the bike to give it a try, and he has stuck with it for six years. He usually performs for three to five hours at a time. The Puppet Bike makes its own schedule. Chock decides when he wants to perform, which is often on the weekend and usually in Andersonville. But there are no set showtimes, so hearing the music on a Friday evening or a Wednesday afternoon is a delight for its frequent passersby. The mystery is part of its charm. The sporadic performances are also due to the fact that Chock and Freudman have full-time jobs as a handyman and musician, respectively. But no matter the weather, the two are always willing to climb into the 500-pound Puppet Bike, blast music from stereo and begin a fantasy-filled routine. The bike has around 15 puppets, and the puppeteers have given most of them names and personalities. The puppets have become somewhat of a Chicago street theatre staple. So much so that Michael King, a former puppeteer for the bike, ventured off to start his own gig. It can be seen around downtown Chicago and in Lincoln Square, ten minutes southwest of Andersonville. 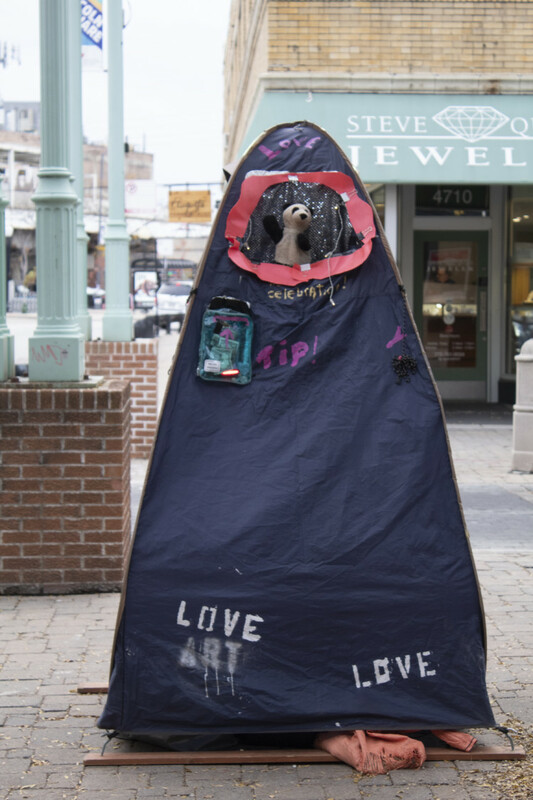 The art form is similar — it’s still a puppet show, but he calls it his “Happiness Machine.” The small tent on the sidewalk of Lincoln Square can be easily missed until the sheer magician’s curtain is lowered, and the panda and tiger begin dancing to the sound of music that fills the street. King started Happiness Machine because he wanted to manage his own time, but still live that high from his street performance gigs. When he isn’t putting on puppet shows, he’s working as a part-time city tour guide and meditation guide. During the winter, he even manages to find time to teach skiing lessons. King typically works for about two hours a day, putting on shows for about 20 minutes and then taking hour-long breaks. On a good day, with a steady flow of traffic on the sidewalks, King can make a few hundred dollars in tips. He doesn’t puppeteer for the money, though — for King, it’s all about making strangers smile. “You know, (it’s for) anybody with a sense of whimsy, wonder and stupidity,” he says. Most of the puppeteers love the whimsy that the puppets exude. 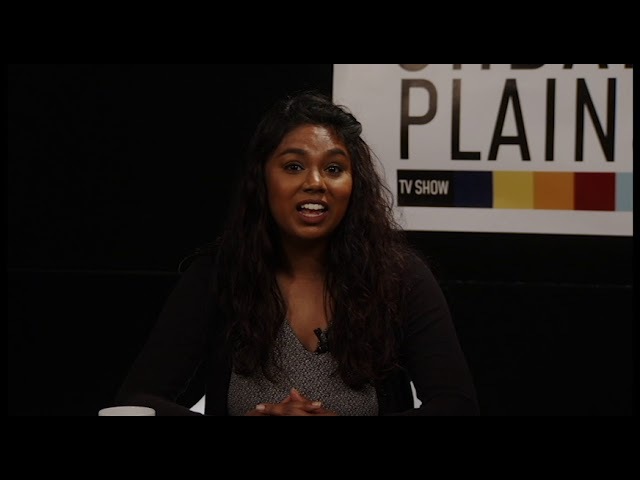 They feed off their magic and lightheartedness, as does the diverse audience that stops amidst the crowded city streets. 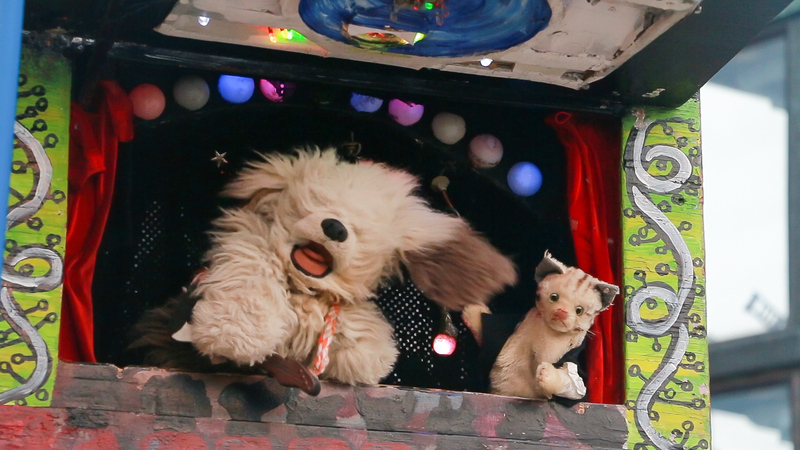 The dog and the cat pop up from behind the Puppet Bike’s curtain this time. Their dancing is perfectly synchronized, with Chock behind the curtain, manning each movement with precision. They do jazz hands, and head nods, and then they kiss, which receives giggles from the onlookers. Their final movement is a wave goodbye as the song comes to an end and the last few dollars are slipped into the tip box.